Jeffrey Lockwood says the book documents how the energy industry has colluded with government in Wyoming to censor freedom of speech and education. Lawmakers are selling the school's academic freedom to the energy industry. They need to back off. 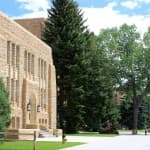 Lawmakers and faculty discussed the University of Wyoming College of Law, and expressed hope for a new era of cooperation after last fall’s chaos. The U.S. is one of the world’s leading emitters of greenhouse gases and Wyoming’s energy policy should aim to reduce emissions. WyoFile requested information related to the suspension of a suspended $9.9M DOE grant to Two Elk developer North American Power Group.